One of the lowest cost airlines in North America – Allegiant Air – could see a double digit rise in unit cost growth in CY2014 stemming from training expense and an aircraft acquisition that the company believes will ultimately generate high returns, but is creating short term pressure since the jets are not producing available seat miles. Allegiant anticipates the challenges it has encountered in pilot training as only temporary and should be resolved by mid-2015. The easing of training expense alongside operating more unit cost friendly A320s should create a more favourable unit cost scenario in CY2015. The company is also staying the course on its network strategy – assigning less priority to launching international service to Mexico, refining its goals for Hawaii and touting opportunities in the US domestic market ushered in by consolidation among the country’s largest airlines. Previously, Allegiant issued guidance of a unit cost increase in 3Q2014 of 8.5% to 10.5%. But its costs excluding fuel grew 14.7% year-on-year in the quarter, as Allegiant estimates that it has spent USD25 million related to a lull in training pilots. The gap in training stemmed from a shortage of proper individuals to carry out training, and the result is that Allegiant in one year is training the number of crew members it would normally train in two-and-a-half years. “This is literally still a hangover from 2013 and issues with FAA resources and the ability to keep us current on some of our training personnel from their side of the house,” Allegiant CEO Maurice Gallagher recently explained to analysts and investors. The company is also spending between USD2 million and USD2.8 million in depreciation expense generated by a deal it struck in Jun-2014 to acquire 12 Airbus A319s that are scheduled for operation by a European airline until 2018. Allegiant estimated that it would record USD30 million in annual lease revenue beginning in Jun-2014, and also assumed USD142 million of secured debt under the transaction. 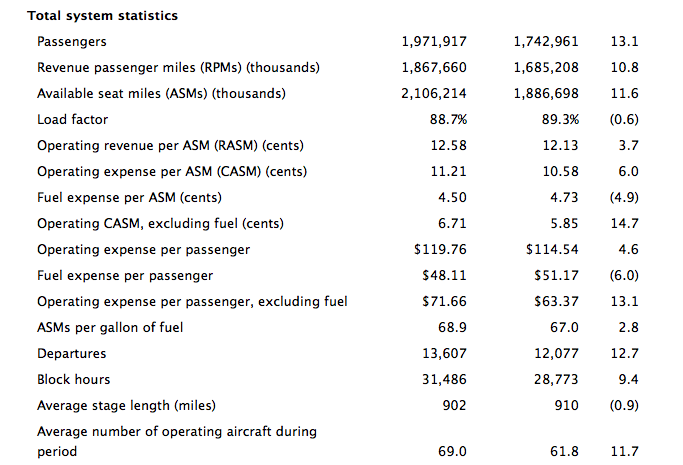 Although Allegiant estimates it would generate approximately USD30 million in annual leasing revenue from the different aircraft acquisition agreements it has executed, it will experience some cost pressure in depreciation and amortisation expense since the aircraft are not generating ASMs. At the end of 2Q2014, Allegiant estimated that the expense would represent 2ppt of unit cost growth in 3Q2014 and a single point for FY2014. 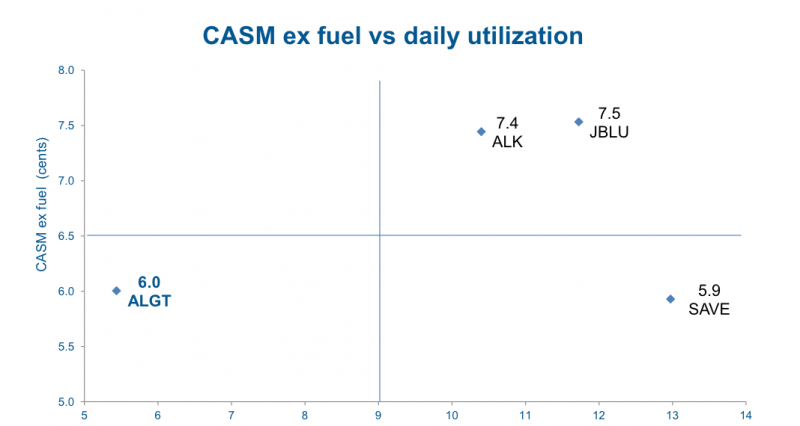 The cost pressure for Allegiant continues into 4Q2014 when it forecast CASM ex-fuel to grow 9% to 11%. Baked into that guidance is some higher maintenance expenses resulting from a larger number of maintenance events occurring versus 4Q2013. Allegiant’s 2Q2014 unit cost growth excluding fuel of 4.2% was below forecast as it opted to push some maintenance expense out to later in the year. Even with the cost headwinds, Allegiant still estimates its unit costs excluding fuel of USD6 cents for the 12M ending 3Q2014 are more favourable than JetBlue and Alaska, which have higher levels of aircraft utilisation, and just shy of Spirit’s USD5.9 cents. However, despite an ability to boast that it still has one of the lowest cost bases among US airlines, Allegiant is forecasting unit cost growth excluding fuel of 9.5% to 10.5% for CY2014, which is significantly higher than projections from US legacy and low-cost airlines alike. Allegiant’s management seems conscious of the fact that its costs are escalating faster than the rest of the industry as Mr Gallagher concluded that, “our only true asset is our cost structure long term and we are very mindful of that”. As it works to get its unit cost growth back to reasonable levels, Allegiant concludes there are still lots of opportunities for its niche model in the US market place. During CY2014 the airline is making a push from Cincinnati in the aftermath of Delta’s pull-down in service from one of its smallest hubs. Its offerings to Cincinnati include service to Orlando Sanford, Punta Gorda, St Petersburg, Fort Lauderdale and Phoenix Mesa. (Based on current schedules from CAPA and OAG for the week of 10-Nov-2014 to 16-Nov-2014). Allegiant has previously explained that a few years ago a market like Cincinnati might have been too large for it to target. But as Allegiant has grown its scale and Delta has pulled down Cincinnati, the market has become more viable. The company estimates that between 2007 and 2014 growth in US airline fortress hubs such as Atlanta, Chicago, Miami, Dallas, Newark and San Francisco increased 2.5% while falling 15.7% as so-called secondary hubs including Cincinnati, Cleveland, Pittsburgh, Memphis and Salt Lake City. Allegiant’s fellow ultra low-cost airline Frontier is also seizing on opportunities in Cincinnati and Cleveland created by consolidation, and is seeing an increase competitive overlap with Frontier in Cincinnati. Frontier and Allegiant are competing on service from Cincinnati to Orlando (Allegiant serves Orlando Sanford), Fort Lauderdale and Phoenix (Allegiant serves Phoenix Mesa). Allegiant has touted Cincinnati as the fastest growing origin city in its history, and previously has hinted there is a possibility that it could establish a base in the market. But Mr Bricker’s comments seem a bit more subdued, which could mean that Allegiant may take a more cautious approach to expanding in Cincinnati as it works to ameliorate its unit costs growth. During the last two years Allegiant has tempered its expectations for Hawaii and refined its service there to year-round from Las Vegas and Los Angeles to Honolulu, and some seasonal operations from smaller west coast markets during the peak summer period. Mr Bricker concluded that Allegiant’s current strategy in Hawaii was producing acceptable returns and that he would expect that stability to continue for the foreseeable future. Allegiant acquired six Boeing 757s to support its operations to Hawaii, but with now tempered expectations and a smaller than anticipated service footprint to the islands, it does have some freed up aircraft capacity. Mr Bricker said Allegiant has plenty of opportunities to redeploy the assets, and some of the 757s will be used in Austin and Cincinnati. But with fuel prices at lowered levels, Mr Bricker noted Allegiant may need to reconsider extending some seasonal periods to Hawaii or adding capacity to existing markets. “Hawaii looks better proportionally to the rest of the network as we adjust to a lower fuel price environment,” he concluded. Allegiant’s total unit revenue growth for its Hawaii markets increased 12.7% year-on-year during 3Q2014. Allegiant’s ambitions to serve Mexico also remain tempered even as the airline has set a debut of new international service in 2H2015 (its original target date was 2014). In outlining its delay of adding new transborder service, Allegiant has concluded the risk-reward scenario of adding US domestic markets is more favourable given the proper technology needed to support international service. Mr Gallagher is not deviating from that message, explaining that Allegiant sees opportunities for transborder service, but “we’ve also got places to put airplanes here in the US that, given my druthers, I would do the US first and the international second”. 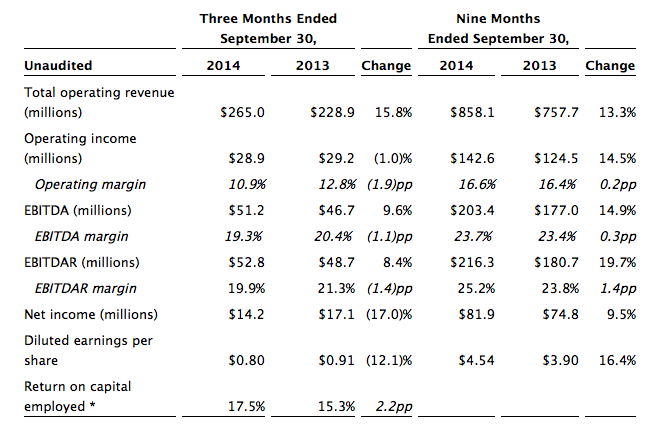 Allegiant’s 3Q2014 profits fell 17% year-on-year to USD14 million even as revenue increased nearly 16% to USD265 million. But operating expenses increased 18.3% to USD236 million, which resulted in a slight drop in operating revenue of 1.2% to USD28.9 million. For the first nine months of 2014 Allegiant increased its net income by 9.5% to USD82 million while operating income grew 14.5% year-on-year to USD143 million. Allegiant characterises CY2014 as a rough year and believes its unit costs in CY2015 should have a “more positive tone”. Given its financial track record that declaration seems reasonable; but it could face cost headwinds through 1H2015. From a larger perspective, the company’s cost challenges in CY2014 shows that even successful ultra low-cost airlines are not immune from cost headwinds. Even Spirit during the last couple of years has felt some unit cost pressure. Allegiant’s most important task going forward is quickly and effectively restoring a reasonable level of unit cost growth to ensure it keeps a pillar of its overall strategy strong enough during the long term.